Nick Accurso & Mr. Dibbs are trying to bring Scribble Jam back! Check their Kickstarter page here. 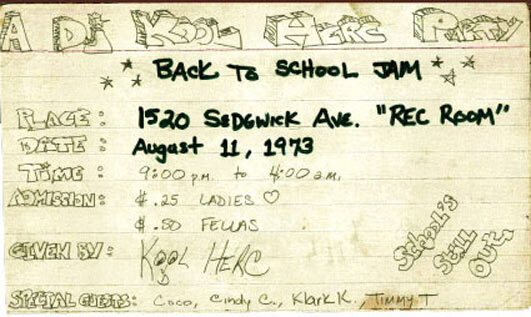 This weekend marked the 40th Anniversary of Kool Herc’s party in the “Rec Room”. Hip Hop was celebrated Sat at Summerstage in Central Park and Sunday at 5Pointz. We were going to post pictures from BillyJam, but he just wrote an epic post for Amoeba which you can check out here. With hundreds of performers still to be announced, the first batch of A3C artists includes Ghostface Killah, Too Short, 9th Wonder, R.A. the Rugged Man, Pharoahe Monch, Jean Grae, Rich Medina and Jarren Benton. Also known as “All Three Coasts,” the festival had its biggest year ever in 2012, with over 20,000 hip-hop fans attending hundreds of performances, panels, films and tutorials — and this year will be even larger. 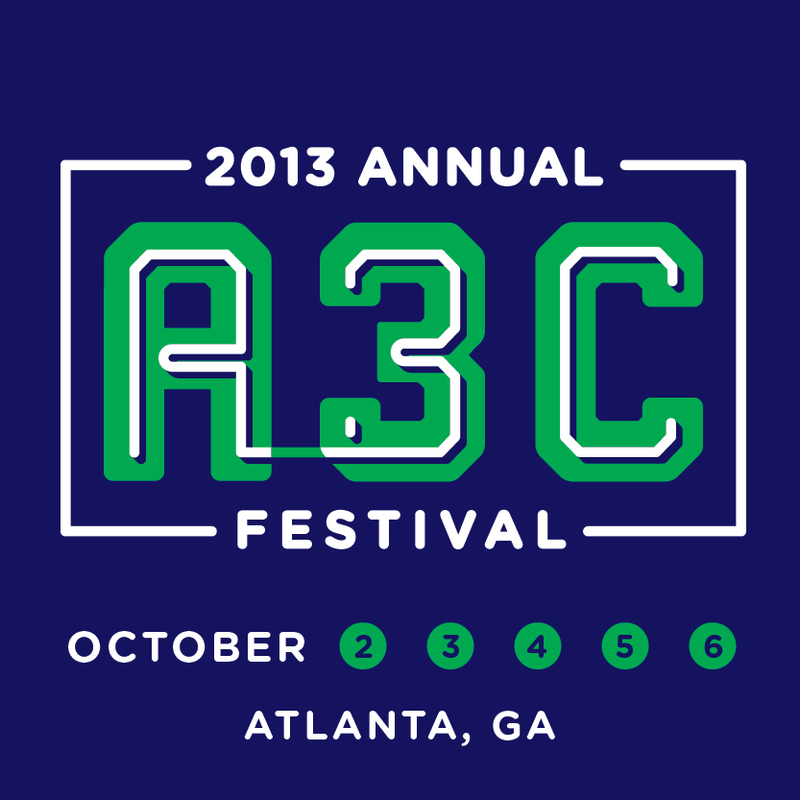 2013’s A3C Festival, running from October 2 – 6, expands to five days and three locations across Atlanta. Free shuttles will be on hand to transport attendees between venues at Little 5 Points, Old 4th Ward and East Atlanta Village. In the spirit of everything that makes A3C one of the country’s largest hip-hop festivals, the expanded dates and locations will provide for a broader and more in-depth film festival (in its second year), pro-audio experience, style village, along with more live music events than ever before. This year’s “A3C Education Experience” will take place at Melia Hotel and include dozens of panels, workshops and speakers. Festival passes are currently only $45 and increase to $50 on July 1. 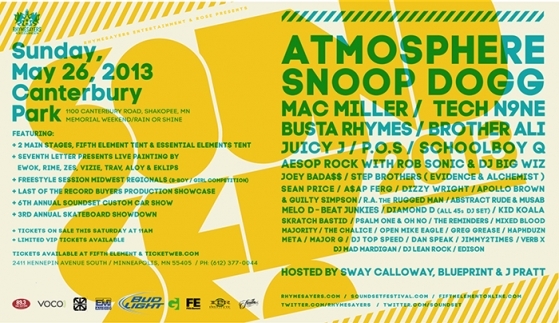 Atmosphere, Snoop Dogg, Mac Miller, Tech N9ne, Busta Rhymes, Brother Ali, Juicy J, P.O.S, Schoolboy Q, Aesop Rock with Rob Sonic & DJ Big Wiz, Joey Bada$$, Step Brothers (Evidence & Alchemist), Sean Price, A$AP Ferg, Dizzy Wright, Apollo Brown & Guilty Simpson, R.A. 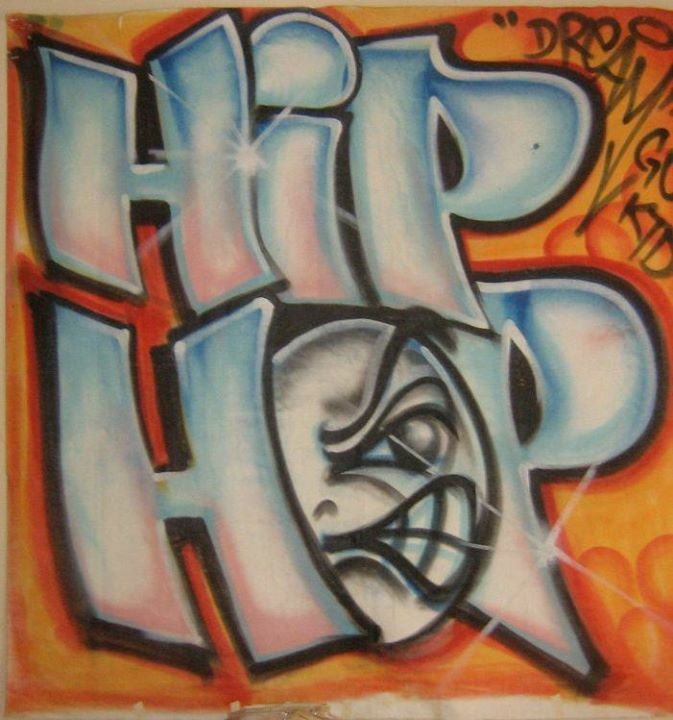 The Rugged Man, Abstract Rude & Musab, Melo D – Beat Junkies, Diamond D (All 45s DJ Set), Kid Koala, Skratch Bastid, Psalm One & Oh No, The Reminders, Mixed Blood Majority, The Chalice, Open Mike Eagle, Greg Grease, Haphduzn, Meta, Major G, DJ Top Speed, Dan Speak, Jimmy2Times, Verb X, DJ Mad Mardigan, DJ Lean Rock and Edison. Hosted by Sway Calloway, Blueprint, J Pratt. Tickets are on sale Saturday, March 9th, 2013 at 11:00AM Central Standard Time to the general public through www.ticketweb.com and Fifth Element. General admission tickets are $49 ($3 facility fee and parking are included in ticket price) VIP options for $100 (includes $3 facility fee) are also available! This year Soundset has partnered with Ironlak and The Seventh Letter Crew to bring some of the worlds most talented visual artists, who will be live painting all day: Ewok, Rime, Zes, Vizie, Trav, Aloy, and Eklips. 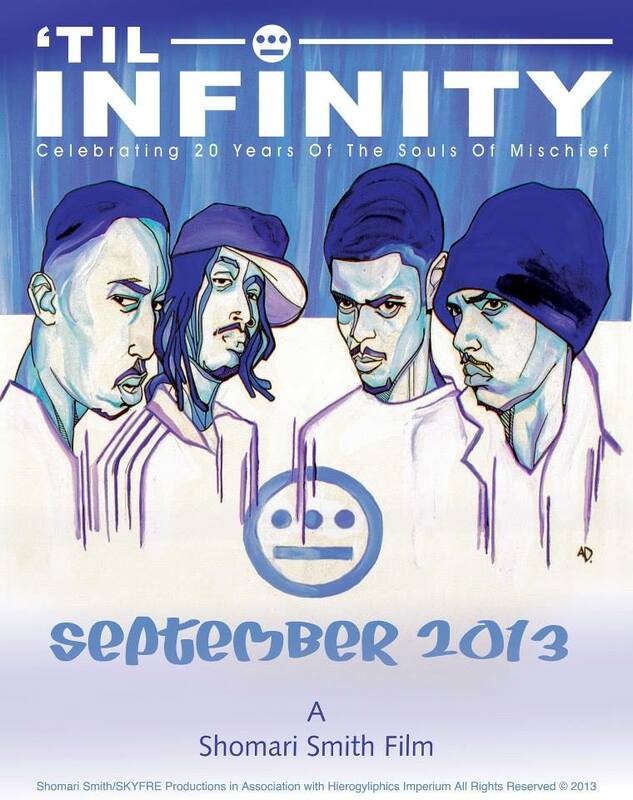 In addition, the artists will be doing a black book signing. Also returning will be the 3rd annual Skateboard Showdown, the sixth annual Soundset Custom Car Show with over 200 cars and a special Last of the Record Buyers live production showcase. 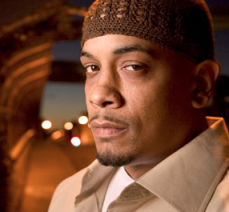 Just read Shock G’s brutally honest account of why Saafir is in a wheelchair. Heartbreaking. 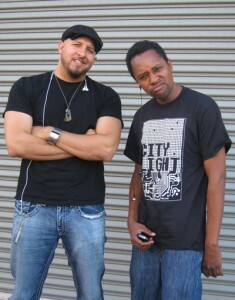 Check it out on Davey D’s blog. Interesting post from FunkProbosci about how a guy named Armen Boladian and his publishing company Bridgeport Music registered the copyright for a bunch of classic Funkadelic records and then sued people for sampling the tracks (he wasn’t working on behalf of the members of Funkadelic). If you’re a musician, you might want to check this out. It’s pretty crazy. Thanks to homie Joe Schloss for passing us the link.